Jewish anti-occupation group If Not Now leading the Jewish Resistance march in Philadelphia; a Toronto chapter of If Not Now is beginning to form. Some members of the Jewish community in Toronto are pushing back against conservatism through panels, presentations, protests, and parties. For many in the community, it’s a welcome change. Since the demise of the Canadian Jewish Congress made way for organizations like the Centre for Israel and Jewish Affairs or the Canadian Jewish Political Action Committee, Jewish grassroots groups have been all but erased from the mainstream in favour of bureaucratic not-for-profit federations and lobby groups that need to play nice with conservative donors. Today, it looks like that tide is turning. In May and December of 2016, I attended two unprecedented panels hosted by the Jewish learning collective Torah in Motion debating different ways to foster LGBTQ inclusion in the Orthodox community. More liberal-minded Jewish institutions, like the URJ Camp George, introduced their own LGBTQ-specific programming the previous year. These discussions may not have been terribly groundbreaking for folks (like me) who have been out of the closet for years; all the same, they represent a promising step forward. Various organizations are also expressing interest in fostering Jewish-Indigenous solidarity, including educational workshops connecting Jewish groups with speakers from the Grassy Narrows First Nation. On June 16, a collective of LGBTQ Jews called No Pride in Zionism is staging a Pride “Shabbat in the Sheets” demonstration against pinkwashing and Canadian complicity with pro-Israel organizations. The Winchevsky Centre is a community school in Toronto for secular Jewish education, and is home to a progressive Jewish group called the United Jewish People’s Order. Founded in 1926, the staunchly secular and proudly left wing UJPO is a testament to the tradition of progressive Jewish community that is currently experiencing a revival in Toronto. The Winchevsky Centre is partnering with various activist organizations to develop programming around five broad themes—Indigenous rights, anti-racism, environmentalism, LGBTQ+ issues, and conflicts in Israel and Palestine. I attended one such event at the Winchevsky Centre last month. Led by Israeli educator, journalist, and filmmaker Lia Tarachansky, the event was a call for broader Jewish anti-fascist action, co-hosted by UJPO and the Jewish anti-occupation coalition, Independent Jewish Voices. As she argued, broad-based community mobilization against fascism is absolutely crucial—both in Israel and here in Canada. 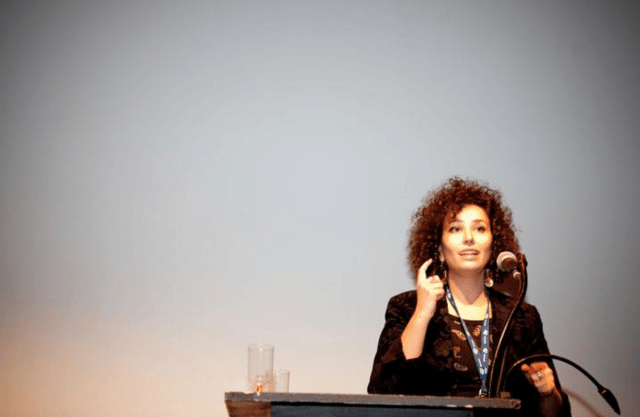 Israeli journalist and filmmaker Lia Tarachansky argues that everyone has an obligation to join the fight against fascism. Photo by by Cindy Boyce. Tarachansky used Umberto Eco’s “Ur-Fascism” framework to discuss the politics underpinning and intensifying the racist systems in Israel. Eco, who grew up in fascist Italy, coined the concept of “Ur-Fascism” (or Eternal Fascism) in 1995 to outline some telltale warning signs of fascist politics emerging in society. She says for years Israeli officials have attempted to scrub out references to Palestinian Arabs in Israeli popular culture, archives, and even textbooks, including removing Arabic as an official language of the state. This is despite the existence of a living archive of groups and journals in Palestine in the decades preceding the Nakba that articulate a sense of specifically Palestinian nationhood. The more Tarachansky talked, the more vivid the image of what she described became. Israel’s pattern of violence against Palestinians is widely documented, but, she says, the full extent of the inequality is harder to grasp. Within four years of Israel’s founding, three different pieces of legislation encouraged the state to seize and redistribute property owned by Palestinian refugees and deny them citizenship—as Tarachansky put it, to “close the door and lock it behind you,” keeping refugees out. Since then, Palestinians living in the West Bank and Gaza are subjects of Israeli military law, stripping them of the basic rights of movement, fair trial, and access to legal support of the kind enjoyed by Israeli citizens. In a fundamental legal sense, their exclusion from the Jewish Israeli nation also disenfranchises them from citizenship altogether. In Israeli courts, she says, when the victims are Palestinian, anything goes; acts of vandalism, assault, and murder go virtually unpunished, receiving lesser sentences and pardons. It was an absolutely necessary discussion, especially considering the renewed necessity of anti-fascist action in Toronto today. 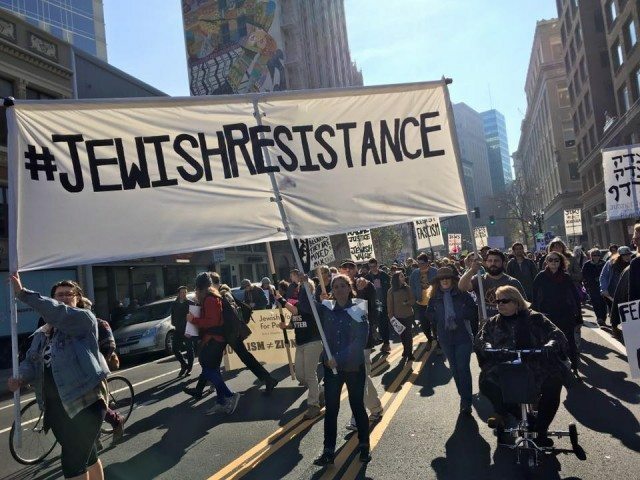 Anti-fascism is becoming more prominent in the Jewish community. At a recent rally in support of Palestinian political prisoners on hunger strike, I spoke to several Jewish activists who described being harassed and threatened by people affiliated with white supremacist groups. In the months following the horrific Quebec City mosque massacre, groups like the Soldiers of Odin, Proud Boys, Canadian Combat Coalition, and the far-right Jewish Defence League stage regular demonstrations at Nathan Phillips Square in support of anti-Muslim violence. According to reporters, members of the JDL were recently arrested in Toronto for alleged acts of violence during these demonstrations. According to one activist, Jacob, the JDL should not be seen as a legitimate force in the Jewish community. From what he and other antifascists tell me, their Jewish membership is remarkably low. “The JDL are mostly Christian Zionists, and they’re basically a mercenary security force,” said Jacob. They have also acted as security for Ezra Levant and others associated with his antisemitic right-wing media outlet, the Rebel. Earlier this year, Jacob alleges that the non-Jewish head of security for the JDL’s Toronto chapter threatened him. “He turned around and said, ‘I’m going to find you and kill you,’” Jacob told me. 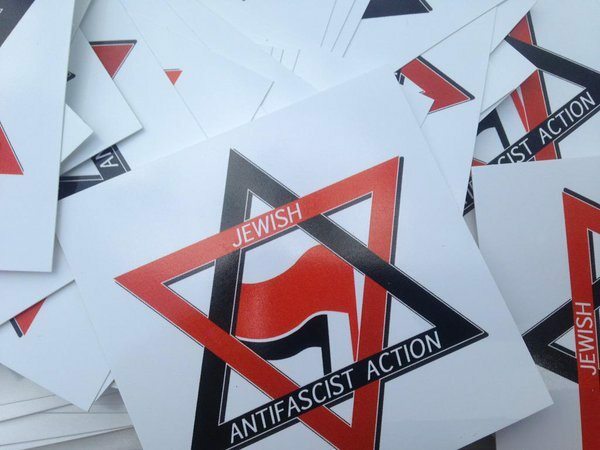 Several JDL members travelled to Washington D.C. in April to attack protestors at the American Israel Public Affairs Committee conference, where two members of the JDL (including one from Toronto) were charged with a hate crime after assaulting a Palestinian father. 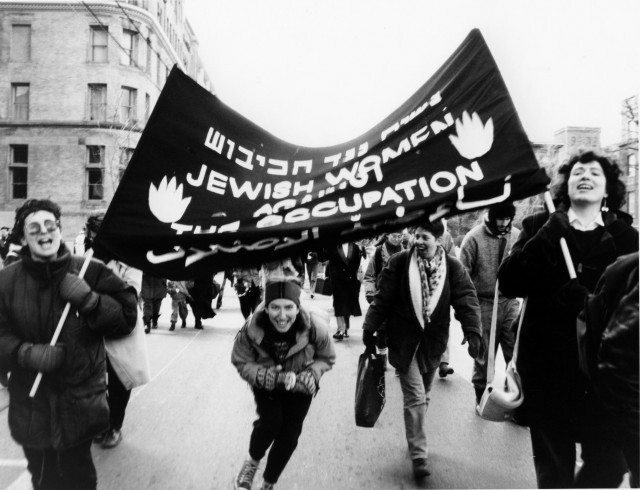 Members of the Jewish Women’s Committee Against the Occupation march alongside Palestinian women on International Women’s Day in Toronto in 1990. Jewish progressive activism, as well as Jewish anti-fascism, is not unprecedented in Toronto. The early 1990s saw the rise of the Jewish Women’s Committee Against the Occupation, which participated in a peaceful demonstration at the Israeli consulate in Toronto, as well as the Toronto-based Jewish Feminist Anti-Fascist League. Treyf recently aired archived audio of a 1993 interview with Les Tager, a founding member of JFAFL. In it, Tager describes JFAFL as a radical Jewish and feminist response to white supremacist organizations like the Heritage Front, which were becoming more active in the city at the time. “We saw this escalation, the desecration of cemeteries and synagogues, and what the media would like to say are isolated incidents of beatings and killings of Jews, and more obvious hatred that was starting to become more acceptable,” said Tager. Her description of the group’s statements, stances, and stand-offs sounded incredibly similar to those offered by Jewish anti-fascists organizing today. The past, as they say, didn’t go anywhere. Energized by Trump, Breitbart, and the Rebel, far right groups are once again out on the streets. It is not a very comfortable time to be Jewish in Toronto. Progressive voices are more vital than ever.